It would have been nearly impossible for any human to have lived up to the hype surrounding the addition of half back Chic Harley to the 1921 Staley’s team. Before he had even played a down on the East Eldorado Street field, Decatur sportswriter and Staleys’ publicist Howard Millard explained that according to many football commentators, Harley was “the greatest back since the days of Jim Thorpe. Now, that is paying the Ohio star a great tribute, but it has been often said that you haven’t seen football until you see Harley in action. 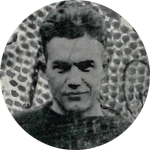 This will be Chic’s first experience at pro football and although only weighing around 155 pounds, his ability to pass, kick and carry the ball should make him as great in the pro ranks as he was in Big Ten circles.” Millard opined that the consensus opinion among sport critics was “that the Staleys landed the biggest fish in football when they secured Chic Harley….” Only a few months later, the great Harley would be broken physically and mentally and alienated from the Staley/Bears tradition. “Charley Harley” [according to his birth register] grew up in Chicago as part of the large family of linotype operator Charles William Harley and wife Martha who had moved west from Ohio in 1893. Even though always small, Charley loved and was good at all sports. He was however, hit in the head by a baseball bat as a child and stayed unconscious for three days. In 1907 the family moved back to Columbus looking for work. It was there most people claim that kids started calling him “Chic” because he was from Chicago while his family called him “noisy” because he was usually so quiet and shy. He attended Columbus East High School starting in 1911 and excelled in football, baseball and track for the black and orange. When his parents needed to move back to Chicago for employment, school administrators convinced them to let Chic stay in Columbus with various teammate families and finish school at East. Usually playing quarterback, Harley was named captain of the Columbus All-Eleven football team at the end of the 1914 season and then captain of the city’s all-star baseball team in the spring of 1915. The Columbus Dispatch reported he received at least one concussion playing football. After spending the summer back in Chicago, Chic returned to Columbus, enrolled at Ohio State University and played freshman football in 1915. Although he often struggled academically and would never receive a college degree, he became the most gifted and prodigious Buckeye athlete for the next few years. Now at halfback, Harley led the football team to back to back unbeaten conference championships in 1916 and 1917 while being named the school’s first All-American both years. He was also the first student to letter in football, basketball, baseball and track before leaving school. In 1916 and 1917 he played against future Staley George Halas of the University of Illinois in both football and baseball. Like many of the future Staley football players, Harley enlisted in the armed services after the U.S. entered World War I. On February 1, 1918 he reported to the School of Military Aeronautics at OSU for eight weeks of classwork before being shipped to Souther Field in Georgia for flight training. In November 1918 he was transferred to Carlstrom Field in Florida and played in one intra-service football game. Early in 1919 he transferred to Kelly Field in Texas and eventually had problems with military rules and at least one superior officer. Chic was court martialed on May 24 and sentenced to three months labor and detention in the guard house. With the help of OSU and Ohio state officials he was given his release and an honorable discharge in time to return to campus and play football in 1919. On November 22, when undefeated Ohio State was beaten in the last minute of the last game by Dutch Sternaman’s Illini, Harley blamed himself and cried uncontrollably for hours after the loss. Chic Harley’s mental condition only worsened over the years. He sometimes played some semi-pro sports and charity games but could never have a real job. His family took care of him and friends at OSU set up a fund to assist him financially whenever needed. In 1936 he entered Hines Veterans Administration Hospital in Chicago and then on October 15, 1938 moved into the Danville, IL veterans’ home for the rest of his life. In late 1948 he received insulin shock therapy and responded in a positive manner that allowed him to travel more often to OSU sporting events and team reunions as well as stay with relatives in Des Plaines, IL for extended leaves. Given much credit in Columbus for elevating the prestige of OSU football and for getting its famous stadium built Chic was honored on several occasions including a massive parade in November 1948 and the presentation of his charter member College Football Hall of Fame award on November 7, 1953. However, to no one’s surprise he never attended any of the Staley team reunions.